I have been using this product for over 15 years. Never have I had a positive heart worm test on my labradors. I will continue to use the product, as for finicky eaters, if peanut butter won't do the trick, it's your dime. I will use my savings on other things. This is effective!! and I highly recommend this product it works just like the heartgard plus. The great about this is the money you can save. Name Brand of the Heartgard for small dogs 6pack is $27.95 wherein the generic version is only $13.95 that a $14 savings. I can buy another 6 pack to have it 12 months supply, but i won't do that. I'll just buy a 12 month supply for a small dog for only $25.95 instead of buying two 6 pack that sums to $27.90. Bottomline, this can save you alot! Written by 5 dogs under one roof. Anytime we feed our dogs a pill it gets covered in peanunt butter. All dogs take this with no problems. They range from a small Miniature Pinscher at 12 pounds, a miniature Beagle at 24 pounds, and three pit shepherd mixes ranging from 45 to 70 pounds. Peanut butter never fails, even our picky pris of a beagle takes it with no issue. love the lower price at the same time I can keep my dog healthy. I have to open his mouth for him to swallow it, but he will do it. I will keep buying it. Thank you for keeping the cost down. 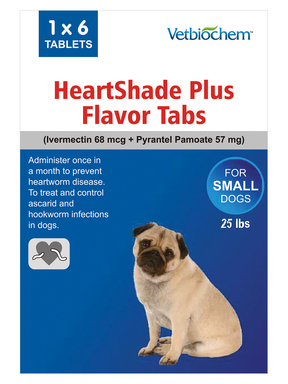 My dogs love this product, however, the large dog generic heartgard plus has been out of stock for a month now. When will there be stock, so that I can order it? My dogs will be out of medicine this month! I am a senior and could not afford to keep my dogs on Hearworm meds if it were not for Pet Shed. A good product at a great price. My dogs won' t chew these either, so I wrap them in cheese or peanut butter. Good for the price.